Put on your running shoes and explore St. Louis with us. 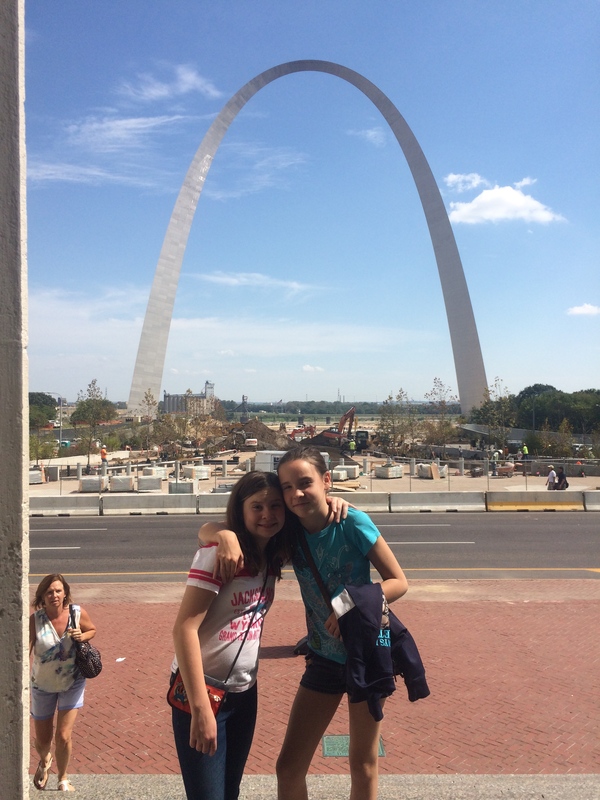 Lets say you only have one day to visit the “The Gateway to the West” and you want your kids to remember the city. Where would you go? How can I save some money and make it fun for the whole family? The St. Louis Arch is the symbol that stands out in everyone mind when you think of St. Louis and it is a magnificent architectural feat. It actually is very inexpensive to visit and a short ride to the top. Since we have the “America the Beautiful Pass” we got a $2 discount and it only cost $24 for a family of four. We also visited the museum store, where we bought our pins, watched a video on how the arch was built and took a ride in a little 4 person pod all the way to the top. The view is amazing even though the windows are only one foot high and two feet long. Tip: Get there early to beat the crowds, it was a 45 min wait to get in the building when we were leaving. We got there right after they opened. After the trip to the top of the St. Louis Arch we decided to walk across the street to the Old Court House (free to enter). The girls got into a great question and answer game with one of the Rangers and he took us on a VIP tour. The girls got to go inside (behind the locked gate) the court room where Dread Scott sued for his freedom and lost his case. He explained to the girls about the case, told us secrets about the court room and let the girls sit in the judges chair. 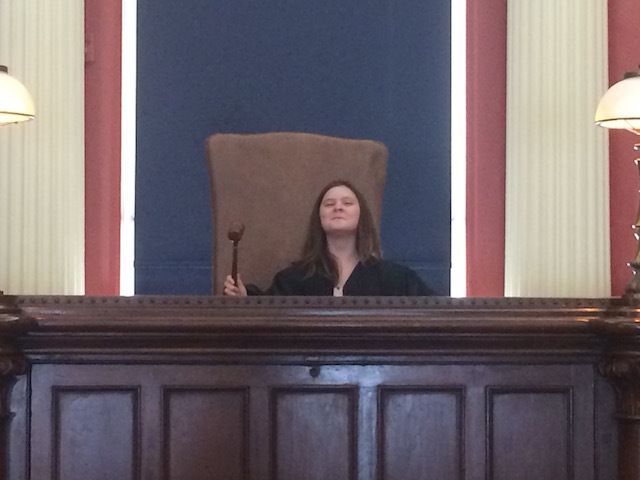 Then he took us to the court room where Dread Scott won his freedom and led us around the room and told us even more info about the history of the building, the judge, and more about the Dread Scott case. Next, since we weren’t ready to head home, we decided to tour the Anheuser-Busch Brewery. The tour is free and they actually give you free beer during the tour and cokes or water for the kids after the tour is over. Our tour had over 30 people but was only 45 minutes long with two great speakers. 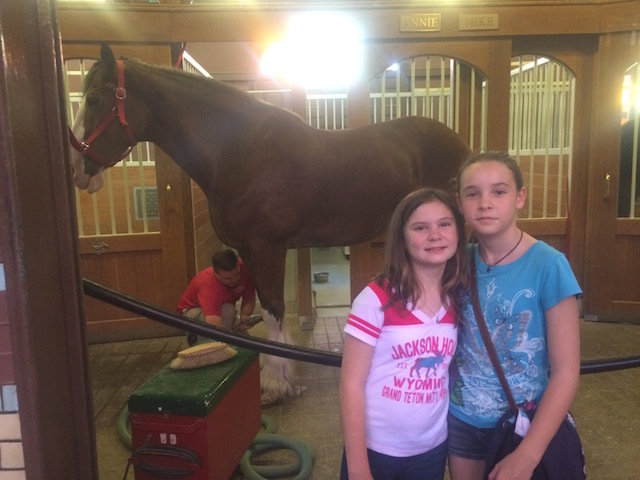 The girls got most excited about seeing the Budweiser horses. We got a short tour of the plant and learned the basics of how they make the beer and visited a few areas inside. 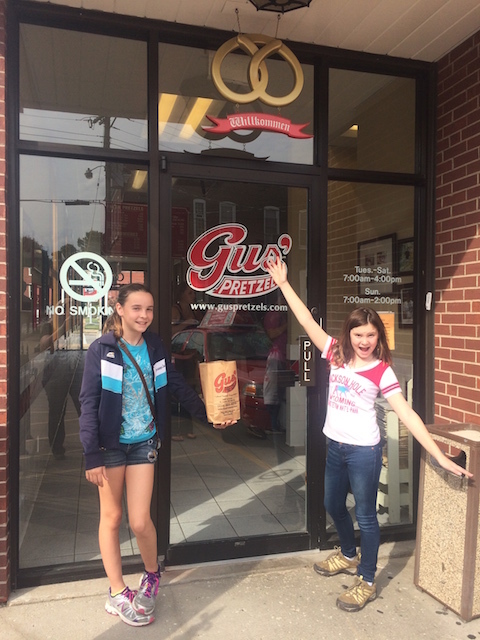 Our last stop before heading back to our 300 square foot home was the most delicious place in St. Louis, Gus Pretzels. You can get a pretzel twist for only fifty-five cent or get my favorite the cinnamon or butter twist for $1.55. They have been in business since 1920 and is a third generation family business. I highly recommend these pretzels but try to get there between 7am and noon to watch as they make them right in front of your eyes. This entry was posted in Art/Music, Civic/Government, Engineering, Geography USA/World, History, Math, roadside america, science, Technology, Unschooling and tagged Anheuser-Busch Brewery, arch, beer, capital, dread scott, gus pretzles, History, horses, old court house, science, slavery, st louis by Chrissie. Bookmark the permalink.